Max PC Tuner is the PUP that uses misleading techniques to prevent removal. Use Reimage to locate malicious components and get rid of them faster than with uninstall instructions. A full system scan blocks virus reappearance and prevents traffic to malicious domains. Can you trust Max PC Tuner? When is Max PC Tuner installed? 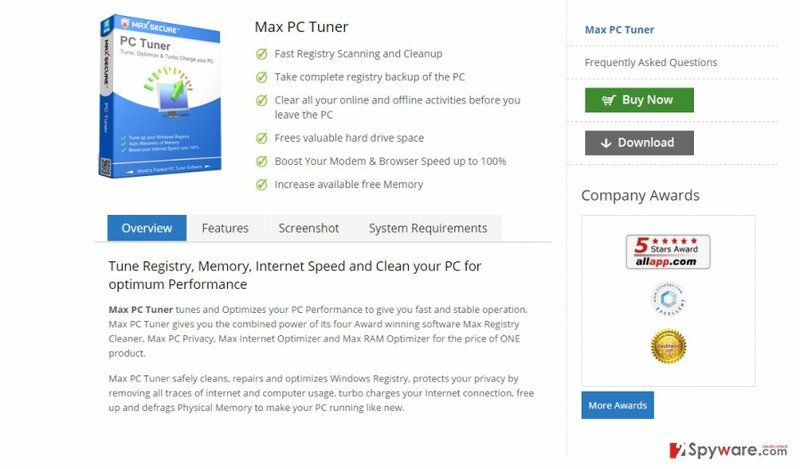 If your computer gets frequently infected with malware or you are simply searching for a reliable anti-malware removal tool, you need to be aware that Max PC Tuner isn’t the right choice. This dubious computer security program might convince you of its fake promises to optimize your PC. However, it constantly alarms you about viruses taking over the computer, while actually no malware has infected it. Thus, for the sake of your system safety remove Max PC Tuner. For that purpose, you might employ Reimage. Every user knows the importance to have a reputable computer security application which provides real-time protection against constant attacks of viruses. Especially after recent ransomware assaults, such necessity has become even more relevant. Therefore, scammers develop various ways to make a fortune out of such needs. If you have been looking for a security application, then you might have easily run into Max PC Tuner. 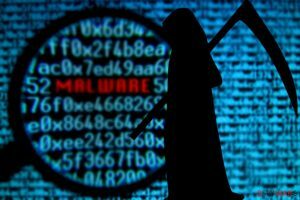 The developers of this program claim to provide fast registry scanning and ensure effective malware removal. Additionally, for those users who enjoy surfing the Web in incognito mode, the program offers to clear all files received from visited websites before turning off the computer. Boosting up browser performance and increasing free space in hard drive might also catch attention. In order to experience these effects, you are encouraged to buy full version. Now let us explain why this software is regarded unwanted. Some IT specialists have named this application as scareware as well. The main essence of it is to generate false notifications about an infected computer. Even if you install the application on a completely new computer and run a scan with Max PC Tuner, it will still manage to find several PUPs and malware. Thus, frightened that a serious virus has infected his or her computer, a victim might instantly purchase full version of the software. In such way the developers of Max PC Tuner virus collect significant income for their “useful product.” All in all, we highly discourage you from installing the application as it doesn’t perform the functions you need. It will not protect you from serious viruses. Thus, it is time to start Max PC Tuner removal. It is not difficult to come across the application if you are in search of an anti-malware app. Likewise, you might have installed Max PC Tuner from its official website. Alternatively, the software might have also found its way into your computer using “bundling” strategy. The principle of this technique is easy. If you happen to install new applications often, you might notice that add-ons come as bonus applications. If you leave them marked, they are also installed. Max PC Tuner might have been installed the same way. That is why we recommend the other sequence of actions. Firstly, select “Advanced” and attentively look for attachments. If you find them irrelevant, make sure to unmark them. This entry was posted on 2016-04-21 at 01:26 and is filed under System tools, Viruses. You can quickly scan the QR code with your mobile device and have Max PC Tuner manual removal instructions right in your pocket. How did you remove Max PC Tuner?